Easy positioning. Easier readings. Easily, the year’s best vacuum gauge. Pulls like a powerhouse. Lifts like a feather. The recovery machine designed for you. Tools to help you flare and swage tubes without needing a third arm. All with the goal of helping you get in, get out and get on to the next job. Not to mention, get your foot in the door. The hilmor Valve Core Removal Tool has a built-in rare-earth magnet on the back of the plunger for convenient jobsite storage. These vacuum pumps have been retooled to make evacuation as easy as possible. Oil is the lifeblood of a vacuum pump and absorbs moisture and contaminants from the system. Pull deep vacuum in less time with hilmor Stainless Steel Evacuation Hoses. Quality bends on the job are a necessity. That’s what inspired us to retool an entire category of tools. All of our bending tools are designed to make every bend something to be proud to show off and a lot easier to complete. Choose the bending tool that fits your needs, and get ready to conquer your job – one precisely bent tube at a time. Cutting, gripping, stripping, and crimping. Our family of Pliers, Wrenches and Wire Strippers let you do all that and more, while each tools’ comfortable grip is a treat for your hands. And they’re built to last — they might even be as durable as you. We’re not just revolutionizing your HVAC/R equipment, we’re also retooling the way you store it. We offer a wide array of smart storage and transport solutions for all your valuable tools. It’s another way we help you conquer from one job to the next. And keep your cool no matter the climate. When it comes to tightening and loosening fasteners, you want tools that can get the job done fast without damaging the screw. Same for the next job and the job after that. That’s why our line of Screwdrivers, Nut Drivers, Nutsetters and Hex Keys are built for the long haul and will help you kick it off or drive it home. Whether you need to bend, crimp, pierce or cut sheet metal or duct work, our family of Sheet Metal and Duct tools are up for the challenge. From Snips to Duct Stretchers to Folding Tools and more, these are all the tools you’ll need to tackle duct work. Get a grip on plastic tubing — a really comfortable one. hilmor’s Plastic Tubing Cutters give you all the features you need without the strain of conventional tubing cutters. Intelligently designed blades give you the upper hand, whether you’re cutting PVC or PEX. Strength and precision come standard with hilmor’s Plastic Tubing Cutters. Trim back on the unnecessary complexities of the job with hilmor’s new line of Copper Tubing Cutters. They’re ruggedly durable, and intelligently designed to slice through copper like it’s their job. Up on a ladder, or stuck in a crawlspace, hilmor Copper Tubing Cutters will perform time and time again. Sure, you have knives. But you don’t have these knives. hilmor’s new line of utility knives can definitely cut it. They’re ruggedly durable and seriously sharp. Plus, they come with all the safety features you need to keep you in one piece. Like a Bi-Metal, shatter-resistant blade. A hose is a hose. Well, until now. We’ve rethought and retooled the hoses you use every day with smart features like an extra abrasion-resistant layer for superior protection in tough conditions. All of our Hoses are rated up to 800 PSI working pressure to work with the newest high-pressure refrigerants. Simply select the Hose and Ball Valves you need. You can choose from Hoses and Ball Valve Adapters individually, or buy them as a set. Manifolds operate as your sidekick on every job. They need to be durable. They need to not leak. They need to excel in even the most extreme conditions. The hilmor line of Manifolds is ready to be put to work with replaceable stainless steel valve seats and SAE-style O-rings. The list of features goes on and on, but the one that matters most is their ability to withstand all the pressures you encounter – day in and day out. From thermometers to thermocouple clamps, hilmor has retooled some of your most important on-the-job necessities. We’ve added the features you need. We’ve lost the ones you don’t. Our products are innovative, simplified and built to help you conquer any job. You need accurate readings, and you need them at a glance. hilmor gauges were made for just that. We improved the graphics, added high-contrast colors and a built-in pressure reminder, and even made our gauges glow in the dark to help you get the reading you need, right when you need it. Our gauges were built to last with high-impact, protective boots. Simply choose the gauge you need, and put it to work. We’re not just revolutionizing your HVAC/R equipment, we’re also retooling the way you store it. We offer a wide array of smart storage and transport solutions for all your valuable tools. It’s another way we help you conquer from one job to the next. If you like to set the bar high, you need service tools that do the same. Our Service Tools will help you tend to every last detail, so you can get the job done right. After all, you know better than anyone there’s no greater reward than doing the little things well. Simple setup, precise positioning and a secure hold that eliminates the need for a third arm. It’s a common theme you’ll find throughout hilmor’s line of flaring tools, and it’s the reason our flaring tools deliver a precise, quality flare every time. Simply choose the flaring tool that fits your needs, and get ready to conquer your next job. 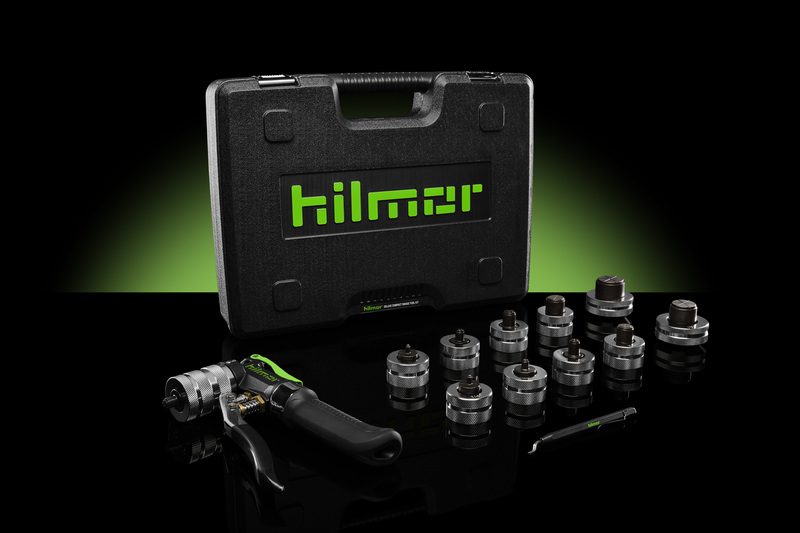 At hilmor, we’ve built our swaging tools around the way you work. We’ve retooled the design to make swaging tools much more convenient and comfortable to use. And our tools deliver. Each one is made to be precise. 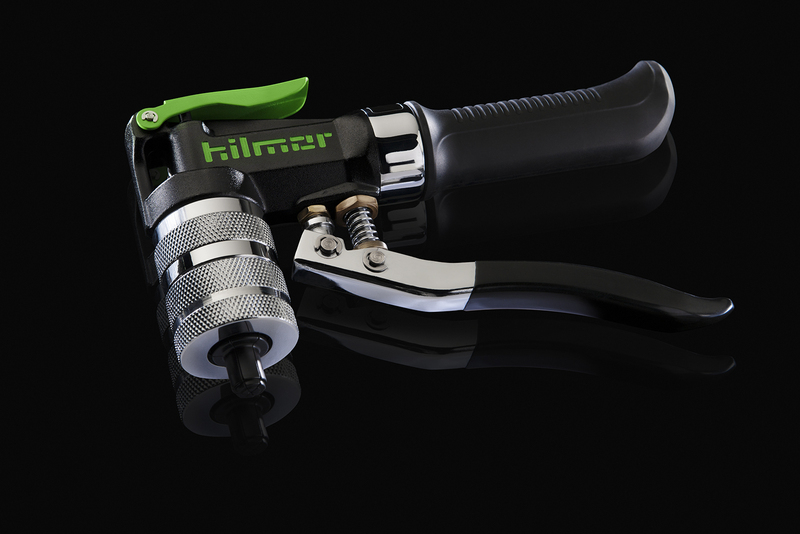 The new hilmor Compact Swage Tool is taking swaging to the next level. It has the power to swage 2-1/8” tubing and the control to swage 1/4” tubing without a crack. With its small, pistol-shape design, it can fit in the smallest of spaces.